After having successful blog, author Jenny Lawson, wrote this memoir from parts of her already written blog and her humor filled life...or imagination. As a blogger myself I had heard about this book through other bloggers. I had never been to the bloggess aka Jenny Lawson blog before but now that I have read Let’s Pretend This Never Happened I am addicted to checking Jenny’s blog. Her humor is just plain awesome. She seems like someone I could be friends and we would laugh all day. I that is probably romanticizing a friendship but I am trying to explain how much I love her sense of humor. I have seen many reviews saying the book is not funny and whiney, or not like David Sedaris, or has to much potty mouth. Ok first thing it is funny...so funny if have a sense of humor and do take things lightly. Secondly the book is not like David Sedaris but to me that is a blessing. I find Sedaris unfunny and kinda mean. As for the potty mouth, there is some but that does not bother me. Cursing and words that make people uncomfortable for others is just part of life. 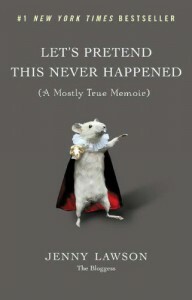 I loved Let’s Pretend This Never Happened and I am now a fan of TheBloggess blog. She has a second book Furiously Happy which is added to my TBR pile. It was actually a book that brought me out of a really bad reading slump. I needed the humor to flood away the depression I have had recently and maybe if you are feeling the same I would say read this if it fits your humor.